Aston Martin is an elite. But the car carrying name One-77 is an elite from elite. Not only the company of Aston Martin did not create for all history anything heaped more up — perhaps, and all over the world hardly it is possible to find cars, so loudly declaring the absolute exclusiveness. Even Veyron which have become by the talk of the town much more mass and accessible, than this work of art on wheels. And its price speaks about its elitism better, than that or-other. 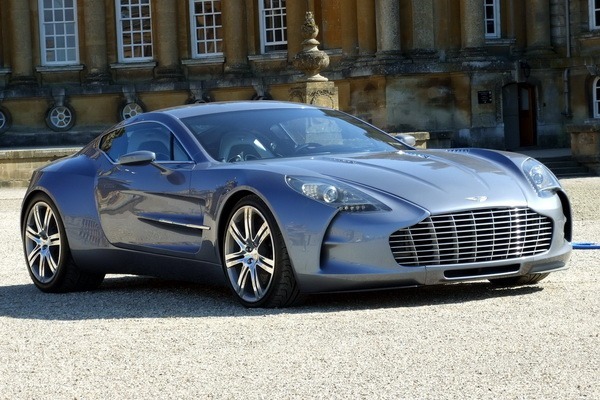 Aston Martin One-77 — one of world champions at cost. For the first time this tremendous car “was lighted” on the Geneva showroom in 2009. However, then it was still far from the beginning of sales, but nevertheless the world could estimate perfection of lines of creation of designers of the company. And the technical component not only did not lag behind from aesthetic, but even tried to surpass it. For a basis designers took racing chassis DTM of classical configuration. At the heart of the car — the composite super rigid monocot constructed in commonwealth with company Multimatic (MTC) — the conventional world leader among the companies working with carbon. The suspender with double cross-section levers also came from the world of races — all in it is directed on drop of unsprang weights and peak efficiency. Absorbers have system of change of ruggedness DSSV, applied earlier exclusively in racing race cars. With them the car is capable to give with equal success the highest level of comfort on distant trips, and to win contenders on a track. In each smallest detail authors One-77 aspired to underline an unknown technological level of the creation. Uniqueness of this fast sports car and its difference even from the most magnificent competitors consists in absolute uniqueness in construction. The cost price practically was never taken into consideration, creation of as more as possible perfect gear was a priority. Therefore One-77 a masterpiece even in details. And the main component of the car became, certainly, mighty V12 volume 7,3 liters — the modified six-liter motor of version DB9. If for manufacturing of engine Aston addressed to MTC the motor is finished by other company-leader in the business — Cosworth. It has 750 h.p., also is one of the most powerful atmospheric motors in the world. More powerfully — only the 760-strong motor of the extreme version of Pagani of the Probe. The composite in a combination to aluminum panels, and also a hard work on weight reduction of all without an exception of gears allowed to finish weight of the large magnificent sporty coupe to 1630 kg. Automatic 6-step gear sequential gear box from DB9 is in addition strengthened for possibility to pass through itself an enormous twisting moment, and with it Aston Martin One-77 is capable to be dispersed from a place to 100 km/h in 3 seconds, and to reach maximum speed of more than 350 km/h. And to stop to the car the super powerful carbon-ceramic brakes protected from an overheat help. Tires Pirelli P Zero Corsa are developed specially for One-77. Certainly, owners of such car would be disappointed by its low price. But in Aston Martin company it is quite expected established absolutely extreme price list — the official price (for India), a component of 4,4 million dollars for a copy, instantly deduced Aston Martin One-77 on top of the list of the most expensive serial cars in the world. At many exhibitions this Aston won the first prize as the most impressing exhibit, and all who saw it “alive”, do not hide the admiration. As they said, it is the most perfect car in the world. It is planned to release only 77 units of Aston Martin One-77, but there is unpleasant news to those who wanted to spend efficiently 4,4 million dollars — all cars are already sold.